Do you want to pick up a book that is interesting enough that you could read it all the way through but helpful enough that it will change your life for the better and make you richer? 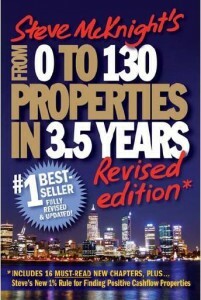 From 0-130 Properties in 3.5 Years by Steve McKnight is not just any ordinary book and by the end of this review you will begin to understand why, and by the time you read this book through you will KNOW why. I felt that it was very important to review this book because this book changed my life. It was this very book that got me out of the ‘negative gearing’ mindset and opened my eyes to the possibilities of positive gearing. It was the first book that took my love for real estate and nurtured it into an investment plan that I could outwork and eventually achieve financial freedom. It is important for me that my readers don’t only get a fun and interesting review but that I give each an every person the opportunity to own this book for themselves and for them to get equipped by learning what this book has to offer. For this very reason I will provide you will a link a the bottom of this page. So if you decide you want to to purchase this book you can do it directly from my favorite online bookstore FishPond. Positive cash flow investing books are hard to find and it is almost impossible to find the book you want at your local bookstore, so I always recommend online purchasing. Do you want to spend $10-$30 to equip yourself to finally go out their and buy a positive cash flow property that could fund your lifestyle? I want to begin this review with a thank you. I want to thank Steve McKnight for putting onto paper everything that he learned so he could help others. Fun fact, Steve cut a deal with his partner Dave that reliquinshed his ownership of almost all of their properties so that in return he could take full control of his property teaching business and help more people. To me that speaks of someone who is committed to helping people and that is someone I would want to learn from. This book details the story of how Steve McKnight and his partner (not life partner but business partner) Dave went from just working to owning over 130 properties in 3.5 years that generated them a total positive cash flow of over $200,000/year. In the course of 3.5 years, and a lot of hard work, they had both achieve financial freedom for their families. The best thing about this book that is it real life. Real life stories about real life investments that you can apply to your real life. It isn’t written by some economist sitting in his office watching the ups and downs of the property market but never actually investing himself. This is written by a true blue Aussie who has gone out there, gotten his feet wet, and actually invested in not one but 130 properties! Talk about someone you want to listen to. The author (Steve McKnight) is a really down to earth guy. You can tell by his photo that he is just your regular average Joe, there is nothing super special about him. But he has achieved something extraordinary and you get to see what he achieved first hand. In this book Steve analyses deals showing you real numbers and how they played out in real life. He shows you how he tried the “renovate and sell” and shows you the numbers for that. You see pictures of houses he bought and how they turned him a positive cash flow. There is so much you can glean from Steve’s past investment experience. Learning from real life stories is 10 times better than reading theories that sound good on paper but don’t work in the real world. The stuff in this book works and Steve shows you the proof to back that up. The principles in this book are timeless and are well worth applying to your life. If you can apply the practical personal finance principles you learned in this book then, even without investing it property, it will make a significant impact into the amount of money you will be able to invest into your retirement. Steve covers the basics such as “Don’t spend more than you earn” but, as a former accountant, he has a great way of making the numbers simple so that they make sense to everyone. He shows you how to avoid bad debt and what you can do to start taking steps towards financial freedom. Steve’s book is smart because he understands that it isn’t just important to teach people about the numbers, but about how to think about the numbers. If you can get your thinking right then you can find opportunities all over the place. If your thinking is right then you can turn almost any property into a positive cash flow machine. However, if your thinking is wrong then no matter how many “practicals” and “financials” you learn you will fail to invest and fail to make any money. If your thinking is wrong then you will turn the best investment opportunities in total duds…I have seen this happen many times before. The biggest chunk of the book is dedicated to your education about investing in positive cash flow properties. It talks about the different creative methods you can use to generate a positive cash flow and it even talks about generating a positive cash flow through owner finance (you can read more about that specific technique in my blog post about making any property positive cash flowed using owner finance ). The education Steve provide is enlightening. However, he only covers each topic briefly and thus you would need further education before you could confidently invest using the methods he talks about. Probably the major flaw of the book, but understandable because each of these methods could be a book in it’s own right. Could You Do The Same and Buy 130 Properties in 3.5 Years? I am not saying you can’t do it (because in reality you can), but the dedication that this requires isn’t likely to be found in many people (including yourself). But…you can achieve something. Let’s take Steve’s timescale of 3.5 years and times it by 10, you now have 35 years instead of just 3.5. Now let’s take Steve’s total amount of properties and divide it by 10, you now need to buy 13 properties instead of 130. Now do you think you could, realistically, buy 13 properties in 35 years? Do you think owning 13 properties would make a HUGE different to your retirement and your cash flow? You betcha it would! If you owned 13 x 3 bedroom houses earning you $350/week (in todays money) in rental income and assuming you paid them off over time (if they are positive cash flowed they will pay themselves off) then that would be $4550/week or over $230,000/year coming into your bank account. Now that would be more than enough to live not just a comfortable retirement, but an exciting one. So even if you can’t achieve a result as substantial as Steve did, it is very possible to still do something and to still earn a great deal of money from positive cash flow property. I am rarely a person who says you “should” do something. I like to give people as much information as possible and let them make their own decisions. I am not one of those people who like to “hard sell” and force you into a position where you feel like you have to buy even though you don’t want to…I hate people that do that. I wrote this review because I wanted to provide you with an honest outline of what this book contains and what I though of this book. However, the fact is that this book changed my life and thus I feel obligated to encourage you to purchase it for yourself and read it. Even if the book cost you $100 it would be worth it. If you just bought one property using the skills you will learn from this book it will more than pay for itself 100 times over. If you are interested in positive cash flow property and you want your financial independence then this is an excellent read.